Nanoparticles are small sized (1–100 nm) particles derived from transition metals, silver, copper, aluminum, silicon, carbon and metal oxides that can easily cross the blood–brain barrier (BBB) and/or produce damage to the barrier integrity by altering endothelial cell membrane permeability. However, the influence of nanoparticles on BBB integrity is still not well-known. In this investigation, effect of nanoparticles derived from Ag, Al and Cu (50–60 nm) on BBB permeability in relation to brain edema formation was examined in a rat model. 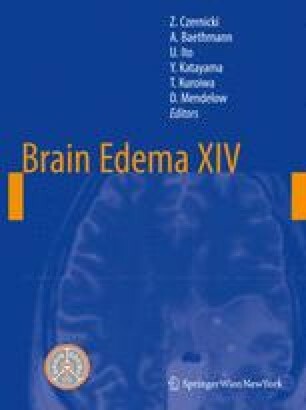 Intravenous (30 mg/kg), intraperitoneal (50 mg/kg) or intracerebral (20 µg in 10 µL) administration of Ag, Cu or Al nanoparticles disrupted the BBB function to Evans blue albumin (EBA) and radioiodine in rats 24 h after administration and induced brain edema formation. The leakage of Evans blue dye was observed largely in the ventral surface of brain and in the proximal frontal cortex. The dorsal surfaces of cerebellum showed mild to moderate EBA staining. These effects were most pronounced in animals that received Ag or Cu nanoparticles compared to Al nanoparticles through intravenous routes. These observations are the first to suggest that nanoparticles can induce brain edema formation by influencing BBB breakdown in vivo. This investigation is partially supported by the Air Force Office of Scientific Research (London), Air Force Material Command, USAF, under grant number FA8655-05-1-3065. The U.S. Government is authorized to reproduce and distribute reprints for Government purpose notwithstanding any copyright notation thereon. The views and conclusions contained herein are those of the authors and should not be interpreted as necessarily representing the official policies or endorsements, either expressed or implied, of the Air Force Office of Scientific Research or the U.S. Government. We express sincere gratitude to several laboratories where a part of the work is done or some data is recorded and evaluated. Financial support from Acure Pharma (Sweden); Astra-Zeneca, Mölndal, Sweden, Alexander von Humboldt Foundation (Germany); The University Grants Commission, New Delhi, India, Department of Science and Technology, Govt. of India, New Delhi is gratefully acknowledged. The authors have no conflict of interest with any financial agencies mentioned above. Technical assistance of Inga Hörte, Kerstin Flink, Madeleine Jarild, Mari-Anne Carlsson, Margaretta Butler of Uppsala University are highly appreciated.